Dark Horse Day is this Saturday, June 4th! 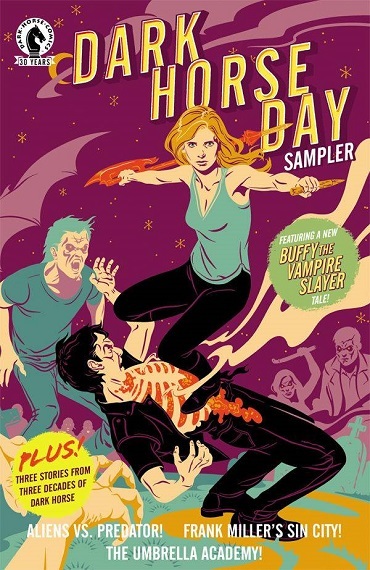 Dark Horse Comics is 30 years old this year, and to celebrate the publisher is offering the Dark Horse Day Sampler , featuring classic stories from past Dark Horse comics, and a brand new Buffy the Vampire Slayer story! Just ask for one at the shop this Saturday and get a copy for free, while supplies last! In addition, any Dark Horse-related items in the store, like comics, toys, or graphic novels, will be 25% off all day Saturday! Drop on by, we’ll be glad to see you! This entry was posted in Store News on June 2, 2016 by Mike. New comics for March 27th, 2019! Free Comic Book Day at Sterling Silver Comics on Saturday, May 4th!